Passed-down through generations, this bread combines many of our favorite ingredients in one loaf: buttermilk for a soft crumb, whole wheat flour for added fiber, and plump raisins for sweetness. Have liquid ingredients at 80º F and all others at room temperature. Place ingredients in pan in the order listed. Select basic cycle and medium/ normal crust. Raisins can be added 5 minutes before the end of the last kneading. Check dough consistency after 5 minutes of kneading. The dough should be in a soft, tacky ball. If it is dry and stiff, add water, ½ to 1 tablespoon at a time. If it is too wet and sticky, add 1 tablespoon of flour at a time. Remove bread when cycle is finished; cool. See our Bread Machine section for more helpful tips and information. Using ingredient amounts listed for large loaf, combine yeast, 1 cup bread flour, and other dry ingredients, except whole wheat flour and raisins. Combine liquids and heat to 120º to 130º F.
Combine dry mixture and liquid ingredients in mixing bowl on low speed. Beat 2 to 3 minutes on medium speed. 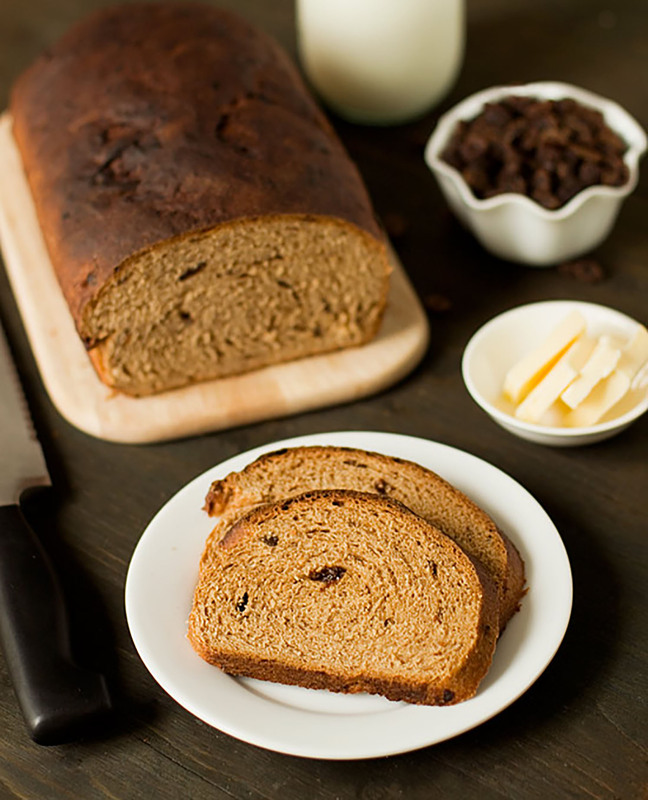 By hand, stir in whole wheat flour, raisins and enough remaining bread flour to make a firm dough. Knead on floured surface 5 to 7 minutes or until smooth and elastic. Use additional flour if necessary. Combine dry mixture and liquid ingredients in mixing bowl with paddle or beaters for 4 minutes on medium speed. Gradually add whole wheat flour, raisins and remaining bread flour and knead with dough hook(s) 5 to 7 minutes until smooth and elastic. Have all ingredients at room temperature. Put dry mixture in processing bowl with steel blade. While motor is running, add liquid ingredients. Process until mixed. Continue processing, adding whole wheat flour and remaining bread flour until dough forms a ball. Add raisins; pulse just until mixed. This recipe is featured at Texan Erin. Due to the low volume of this loaf, the medium recipe can be used in a small (1 lb. loaf) machine. this recipe needs gussying up. I added cinnamon, allspice, vanilla, and orange zest. I like my loaf a little less bland than the original printed here. Some folks might also want to add chopped nuts, quinoa, or hemp hearts. This is a recipe I sure could use to make a loaf for us. Thank you!